Imani Mixon is a Detroit-based writer. 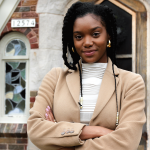 After graduating from Northwestern University’s Medill School of Journalism, she returned to her hometown of Detroit to document its history and resurgence, with a particular focus on neighborhood change. Last year, she wrote weekly articles about Detroit’s North End neighborhood as an On The Ground project editor with Model D Media. Imani will continue to explore the city’s rich neighborhood stories through a year long position as a podcast producer/trainer in Detroit’s MorningSide neighborhood. You can find her wherever the best conversations or freshest ideas are happening.